The Toshiba Qosmio X305-Q706 offers some of the latest high-end components in an enormous, flashy package, but its performance doesn't outshine the competition. 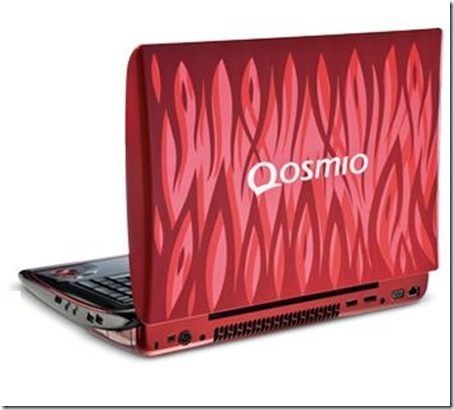 Toshiba's Qosmio X305 can best be described as a mobile gaming platform. The system is so large and draws so much power in order to drive all the hardware that it really doesn't work well as a portable laptop that isn't plugged in. When it is plugged in, it provides some of the best 3D graphics performance available which is great for those looking to play PC games on it. It is also well priced for the amount of hardware that comes in it. Now, if only they could make the design a little more subdued. The Toshiba Qosmio X305 is the most uniquely-designed notebook I have tested. This notebook is unlike any other and anyone who carries it will get looks wherever they go. It has good gaming performance and an effective cooling system. The sound system is the best on any notebook, and the variety of ports is impressive. Unfortunately, there are too many cons for me to give this notebook my recommendation, at least in this configuration at this price point. It simply does not measure up to the competition. Lower-priced versions of the X305 around the $2,000 price point are available and a far better value than our top-of-the-line Q708 model. If you’re looking for a gaming notebook that backs up its hot looks with blazing performance, put the Toshiba Qosmio X305-Q708 on your short list. However, be prepared to shell out more than four grand for this speedster, and don’t even think about wandering too far from a power outlet. So, now I'm tempted to sell this Toshiba and go with Gateway which has a better LCD screen, better CPU, better video card, and more gamma colors. We appreciate the 17-inch Qosmio X305-Q701's cool looks, low price, and great stereo sound, but just a little bit more cash can buy a laptop that's better for watching movies or gaming. NVIDIA GeForce 9700M GTS: The 9700M GTS is not based on the G96 (as the GT) but on the G94 core with 48 shaders. PureVideo HD helps the CPU in decoding HD videos. Non demanding games should be playable with these graphics cards. » Further information can be found in our Comparison of Mobile Graphics Cards and the corresponding Benchmark List.